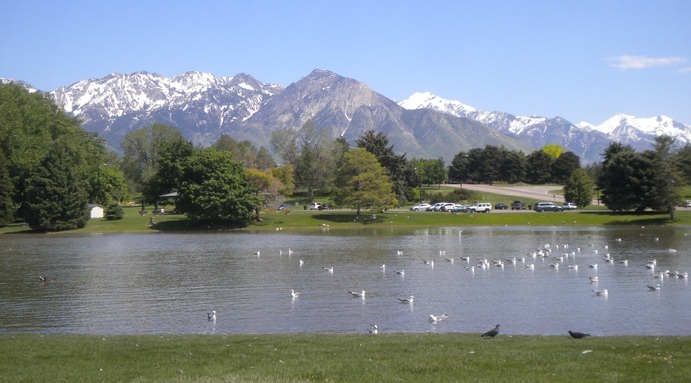 Sugar House Park offers two different running loops, both great for short distance runs, interval workouts, and hill/form work. The inner loop is paved, and offers roughly 1.4 miles of rolling hills. The outer loop is made up of grass, and roughly 1.8 miles long. Just east of the park, there also sits a 400 meter, all-weather track which is open to the public as well. Note: The park is open daily from 7a.m. through 10p.m. in the summer, and from 7a.m. through 9p.m. in the winter. If you’re looking for a quick 1-mile warm up before hitting Sugar House Park for some intervals, you can start at the St. Ambrose Catholic Church, and follow the map provided above, to Sugar House. Just to the west of the park is the Sugar House Shopping Center (Whole Foods, etc.). Add-Ons: There are some good add-on opportunities from here. Residential Neighborhood. A pleasant residential neighborhood, north of the park, staying west of S 2100 E and east of Liberty Park, or south of I-80 to Hudson Ave.
Parleys Creek/Tanner Park/Parleys Historic Nature Park. Just east of Sugar House Park. Several additional miles of trail running. See our route! Liberty Park. About 2.5 miles northwest of Sugar House Park. Great park with inner and outer loop options. See our route!